Experience a superb riverine horse riding safari from a four star private game reserve located twenty minutes from the iconic safari town of Maun, the gateway to the Okavango Delta. Explore the banks of the Thamalakane River and experience an abundance of wildlife including giraffe, zebra, springbok, ostrich, eland, gemsbok and kudu as well as an extensive variety of bird life. If you are a beginner, you can easily join this ride. We have horses suitable for all levels of riders so there is the opportunity to join a ride (or do a separate slower ride) if you wish. Beginners love it! For non-riders there are additional activities possible. Please see below. Am Walk followed by drive to picnic lunch spot. Additional activities such as scenic flights over the Okavango Delta via helicopter or light aircrafts are also available. 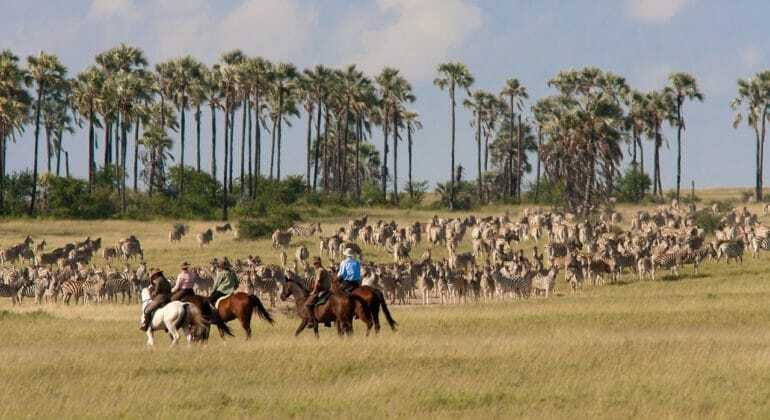 This wonderful horse riding safari starts at a special rate of US $285 per person per night (US $855 for 3 nights), fully inclusive except drinks (table wine included at dinner) and laundry. This rate is valid only in January and February 2016. Rates are per person per night inclusive of accommodation, all meals, all horse riding, airport transfers. Rates do not include drinks, laundry or local gratuities. This horse riding safari takes place in a private game reserve 20-minutes from Maun. Return transfers from Maun airport are included.